Your Iceland adventure gets off to a good start by heading straight from the airport to the Blue Lagoon, only a 15 min drive. The Blue Lagoon offers visitors a chance to rekindle their relationship with nature whilst soaking up scenic beauty and breathing pure fresh Icelandic air. This unique spa features a huge outdoor lagoon filled with geothermal hot water whose active ingredients (namely: natural mineral salts, white silica and blue green algae) have become internationally known for providing the visitor with an unforgettable bathing experience. Set amidst a dramatic field of black basalt lava - the powder-blue mineral rich waters are the run-off from a nearby geothermal project with temperatures in this stunning lagoon averaging a relaxing 35-40°C. In addition to bathing in the lagoon, visitors have access to a sauna with a view of the lagoon, a steam bath with white walls that resemble silica mud and a cozy steam bath carved into a lava cave. There is also a waterfall providing the most wonderful energizing massage. After the lagoon your driver will bring you to your hotel in Reykjavík, a 30 min drive, and after you have settled in he will take you on a short city center tour where you can find many restaurants and coffee shops. Overnight in Reykjavik. Today we will head for Hvalfjörður, the Whale fjord, where we will see the small whale factory and remains from the Second World War when the fjord was the base for the Allies’ ships. In this tour we explore and discover the beautiful west and it´s saga. The road leads to Borgarfjörður to see the magical Hraunfossar waterfall pouring through the lava field into the Hvítá, and the cascades of Barnafoss. The tour continues to the romantic and historical Reykholt, the home of Iceland’s great saga writer, Snorri Sturluson. We will return via Deildartunguhver, Europe’s most powerful geothermal spring and then we cross the old bridge over the mighty Hvítá to head for the Snæfellsnes peninsula. On the way you will experience Mýrar, remote beautiful farmland, and stop for coffee at Longufjorur where the Arctic Tern nests by the roaring Atlantic Ocean. After a full day of Iceland´s beautiful nature you will arrive at your hotel, located by the ocean and surrounded by a lava field. You will stay this night at Hotel Budir or similar. Snæfellsnes is the home of Snæfellsjökull glacier, famously featured in Jules Verne’s “Journey to the centre of the Earth”. 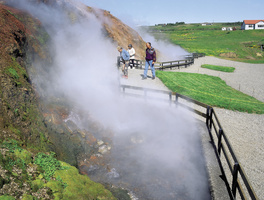 Explore the mystical coast line of the Snæfellsnes peninsula, an area of outstanding beauty famed not only for its supernatural powers and otherworldly connections but also for its profoundly interesting geological history. Although the main tourist attraction of the peninsula is the glacier there are many other wonderful sites to visit in Snæfellsnes. The glacier is believed to be one of the seven main energy centres of the Earth! 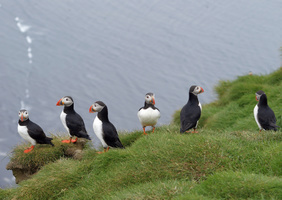 In the summer time you can see hundreds of sea birds in the coastline’s cliffs. The picturesque Arnarstapi has one of the most interesting beaches in Iceland, full of caves, canyons, holes and cliffs made of columnar basalt, a beautiful reminder of the volcanic energy underneath. Only ten minutes away you will find Hellnar, a tiny village where the bewitching Baðstofa cave is located, famous for its peculiar luminosity and shading. Is the gateway to the centre of Earth here? Come find out with a visit to the Vatnshellir Cave, a cavern of fascinating lava formations. After the cave we drive by the coastline and visit the small fishing villages of Olafsvík and Grundarfjordur where you have the view of the majestic Kirkjufell mountain. You will also drive through the spectacular lava field of Berserkjahraun where the Icelandic saga says Viking berserk outlaws roamed in the old days. After this you arrive at Stykkisholmur with it´s beautiful harbor where you can settle in at your hotel and have dinner or ask you driver to take you to a restaurant by the harbor. Overnight at Hotel Egilsen or similar. After breakfast, we head north. Prepare for a long drive through the very essence of Iceland´s spectacular panorama. Spend the day experiencing the remote untouched nature surrounded by mountains. We take mountain roads and go over heaths and finally arrive at Skagafjord way up north. This is the real Icelandic countryside where natives are fiercly proud of their horses and saga culture. This is where Örlygsstaðabardagi took place, the largest battle Iceland has ever seen, in the Sturlunga age. We will go for a one-hour horse riding tour in the Skagafjordur area before arriving in the town of Saudarkrokur where we check in at the oldest hotel in Iceland, since 1884, where you can relax and freshen up before dinner, after a long full day in Icelandic nature. Overnight at Hotel Tindastoll or similar. After breakfast, we take the road to Akureyri. 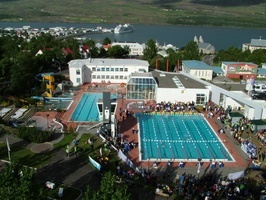 Nestled at the head of Eyjafjörður, Iceland’s longest fjord, Akureyri is North Iceland’s largest fishing port, and its cultural, industrial, and trade capital. The drive to Akureyri takes 1-1,5 hour. We go straight to the local airport where you take a 30-min flight north to Grimsey, the tiny 5-sq km island 40 km off the north coast of Iceland (pop. 100). This is the only part of Iceland bisected by the Arctic Circle. Here a local guide will welcome us and take us on a 1-hour walk around the island, after which you will receive a certificate for having crossed the Arctic Circle. After our flight we drive or fly for 30 min to the charming, small town of Husavik – the whale watching capital of Iceland. We will have lunch in a lovely restaurant by the harbor. From here, a 50 minute scenic drive along the north-east coast brings us to Asbyrgi, horseshoe-shaped canyon, surrounded by magnificent cliffs. This place is known to be the meeting place of the pagan gods. We head back to Husavik and drive to Godafoss waterfall, the waterfall of the gods. Enjoy a hike to the center of the canyon. In the afternoon, we head for dinner at the spectacular lake Myvatn. You can check out the Cowshed restaurant as a good choice or have dinner at your hotel. Overnight at Myvatn Fosshotel or similar. Located in the heart of north-east Iceland about 105 kilometres (65 miles) south of the Arctic Circle, Lake Mývatn with its unique nature and rich birdlife is one of Europe´s greatest natural treasures. Shaped by repeated volcanic eruptions and seismic activity down through the ages, the landscape around the 36.5 km2 lake situated at an altitude of 277 m above sea-level provides a spectacular panorama of surreal lava, crater and cave formations, Sulphur streaked mountains, and sweeping wetlands teeming with plant and birdlife which, in summer, are home to the swarms of midges that not only give the region its name but also provide a major source of nutrition for fish and birds. You will experience the beautiful Dimmuborgir, Dark City, a very special lava formation, and visit the active geological site of Námafjall. 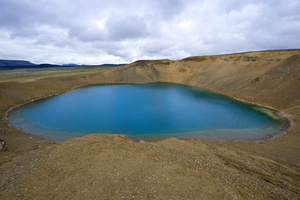 In the afternoon you can relax in the Myvatn Nature Baths, sometimes called the Blue Lagoon of the North. Stay a second night at Myvatn Fosshotel. Today we head east, taking a small detour to watch the majestic Dettifoss waterfall in Vatnajökull National Park. It is reputed to be the most powerful waterfall in Europe. It is situated on the Jökulsá á Fjöllum river, which flows from the Vatnajökull glacier and collects water from a large area in Northeast Iceland. Today we head east across the stark and barren northeast highland plateaus to Seydisfjordur in the Eastfjords. This is reindeer land where you can expect to see herds of reindeers roaming the plains and hillsides. The halfway point is a coffee break at Sænautasel Farm, a reconstructed turf farm on a 37- mile-long remote heathland called Jökuldalsheiði. Halldór Kiljan Laxness, Iceland’s Nobel Prizewining author, used the farm as the setting for his novel Sjálfstætt folk, or Independent People. We end the day in Seyðisfjörður, one of Iceland’s most picturesque coastal towns. Nestled in a long, calm, fjord, lined with snowcapped mountains and tumbling waterfalls, the town is known for its colorful 19th century houses. 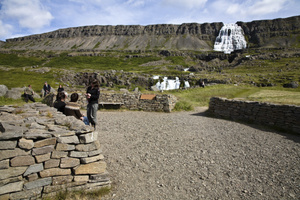 We´ll use the late afternoon and evening to explore the village of Seydisfjordur, including the Skaftfell Cultural Center, which hosts visiting artists from all over the world. 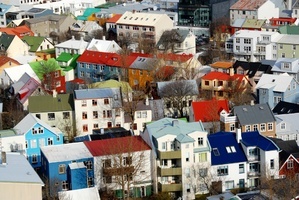 The streets of Seydisfjordur are lined with colorful Norwegian wood kit homes from the 19th and early 20th centuries. 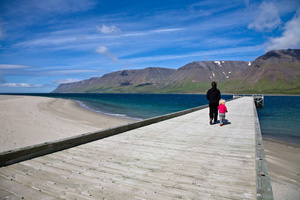 With a thriving arts scene, Seydisfjordur also serves as car ferry port to mainland Europe. In time for dinner, we check into your lovely hotel in the town of Egilsstadir. Stay at Lake Hotel or similar. Today, we´ll explore the fjords and mountain passes of the East Coast, before we head to Egilsstadir for your evening flight back to Reykjavik. Overnight in Reykjavik. Your time in Iceland is unfortunately up. We will get you safely to the airport 2-3h00 before you scheduled flight. We look forward to receiving you next time!